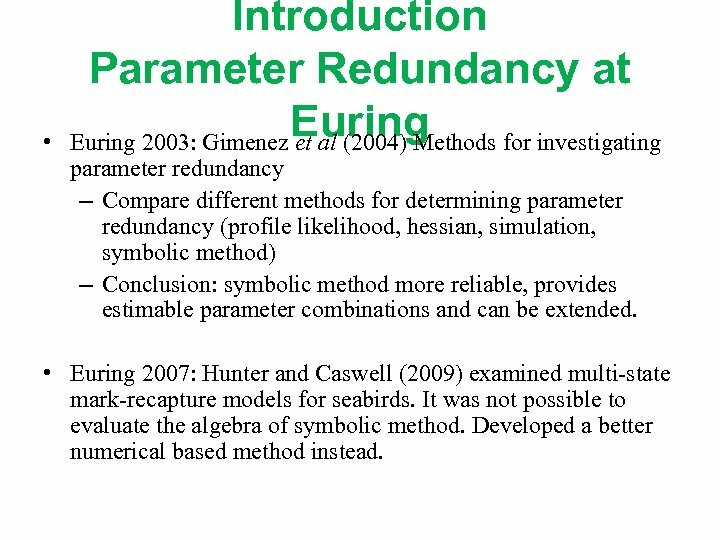 • Introduction Parameter Redundancy at Euring 2003: Gimenez et al (2004) Methods for investigating parameter redundancy – Compare different methods for determining parameter redundancy (profile likelihood, hessian, simulation, symbolic method) – Conclusion: symbolic method more reliable, provides estimable parameter combinations and can be extended. 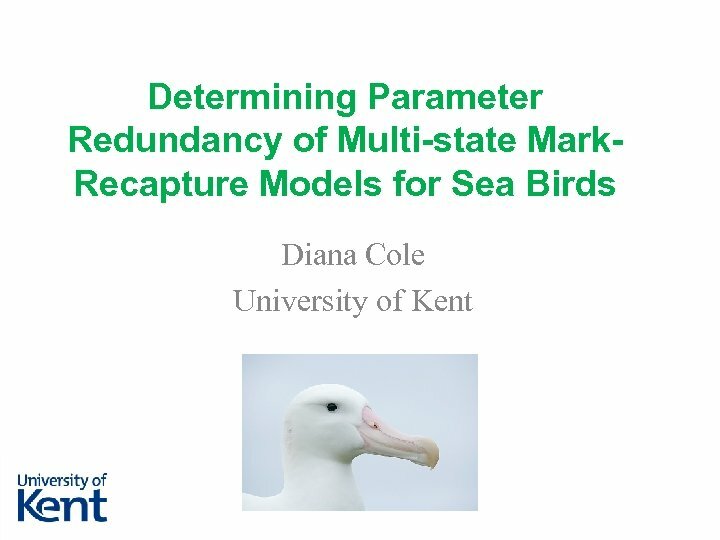 • Euring 2007: Hunter and Caswell (2009) examined multi-state mark-recapture models for seabirds. It was not possible to evaluate the algebra of symbolic method. Developed a better numerical based method instead. 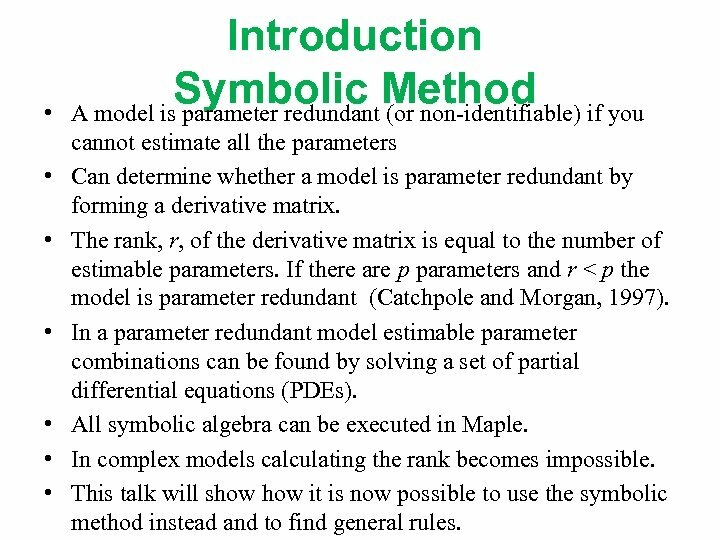 • • Introduction Symbolic Method if you A model is parameter redundant (or non-identifiable) cannot estimate all the parameters Can determine whether a model is parameter redundant by forming a derivative matrix. The rank, r, of the derivative matrix is equal to the number of estimable parameters. 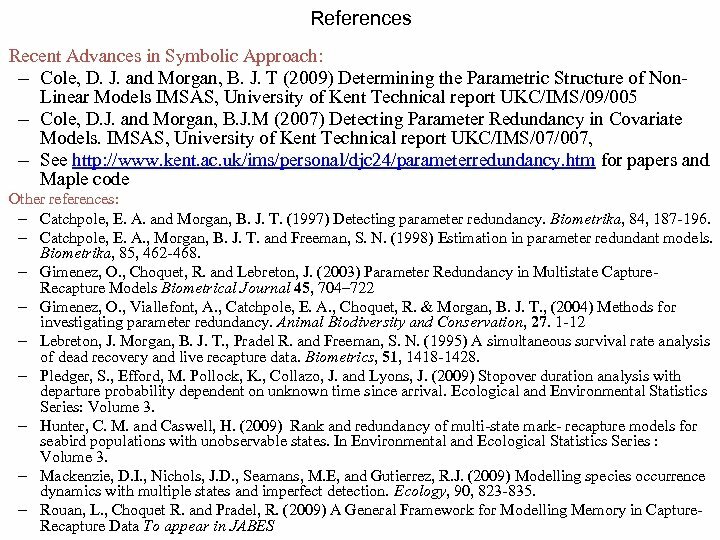 If there are p parameters and r < p the model is parameter redundant (Catchpole and Morgan, 1997). In a parameter redundant model estimable parameter combinations can be found by solving a set of partial differential equations (PDEs). 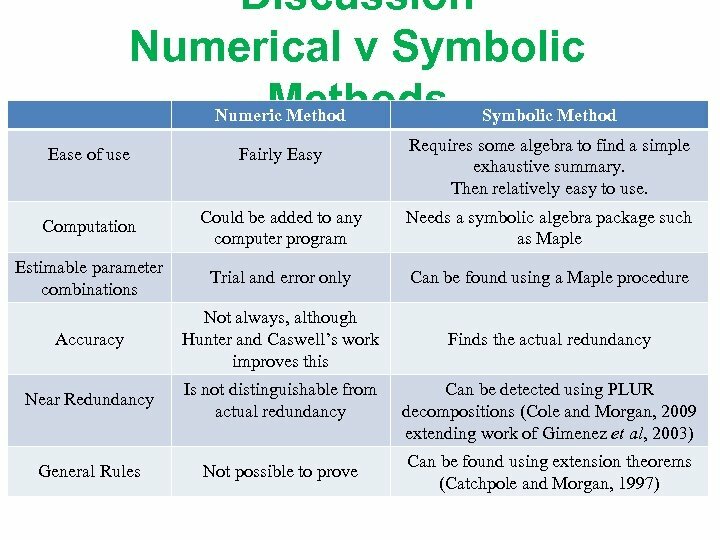 All symbolic algebra can be executed in Maple. 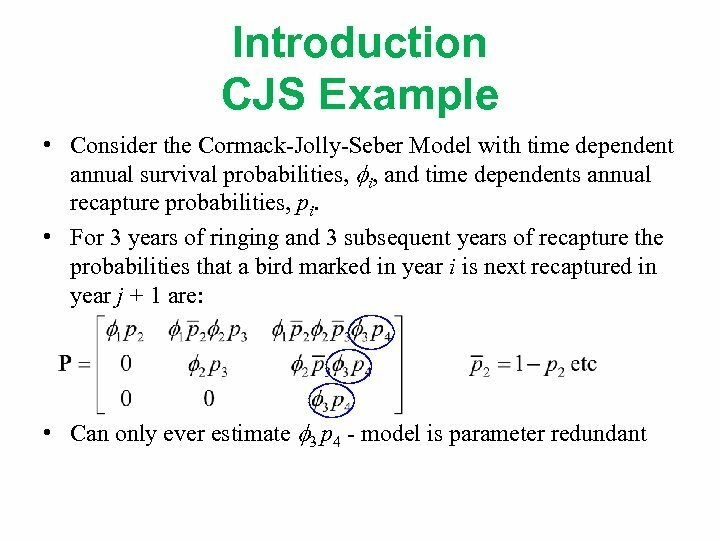 In complex models calculating the rank becomes impossible. This talk will show it is now possible to use the symbolic method instead and to find general rules. 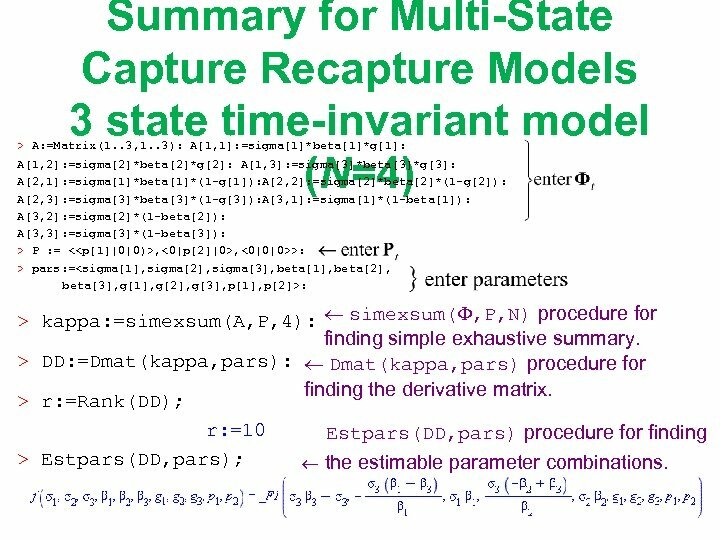 Summary for Multi-State Capture Recapture Models 3 state time-invariant model (N=4) > A: =Matrix(1. . 3, 1. . 3): A[1, 1]: =sigma*beta*g: A[1, 2]: =sigma*beta*g: A[1, 3]: =sigma*beta*g: A[2, 1]: =sigma*beta*(1 -g): A[2, 2]: =sigma*beta*(1 -g): A[2, 3]: =sigma*beta*(1 -g): A[3, 1]: =sigma*(1 -beta): A[3, 2]: =sigma*(1 -beta): A[3, 3]: =sigma*(1 -beta): > P : = <, <0|p|0>, <0|0|0>>: > pars: =: > kappa: =simexsum(A, P, 4): simexsum( , P, N) procedure for finding simple exhaustive summary. 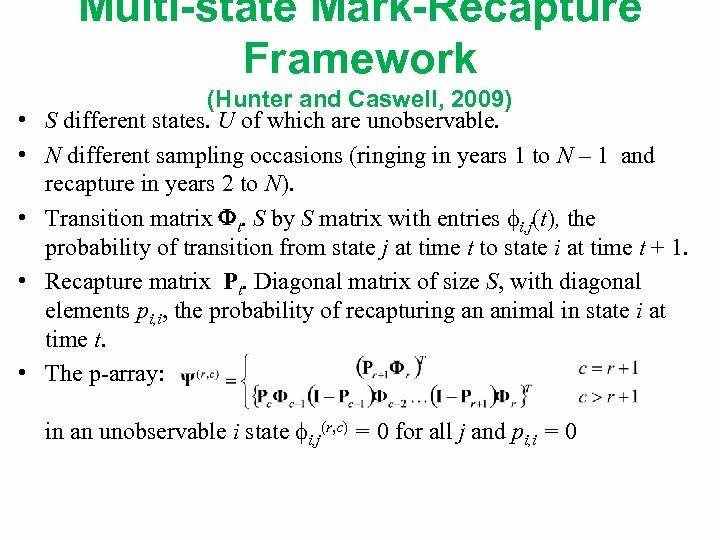 > DD: =Dmat(kappa, pars): Dmat(kappa, pars) procedure for finding the derivative matrix. 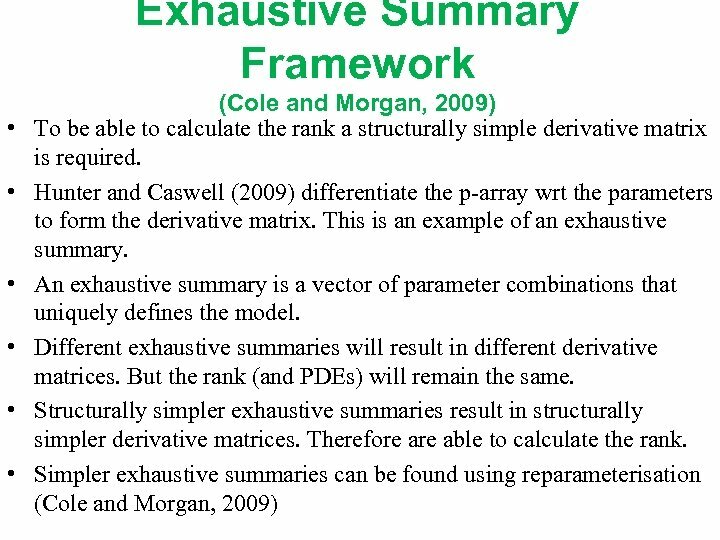 > r: =Rank(DD); r: =10 Estpars(DD, pars) procedure for finding > Estpars(DD, pars); the estimable parameter combinations. 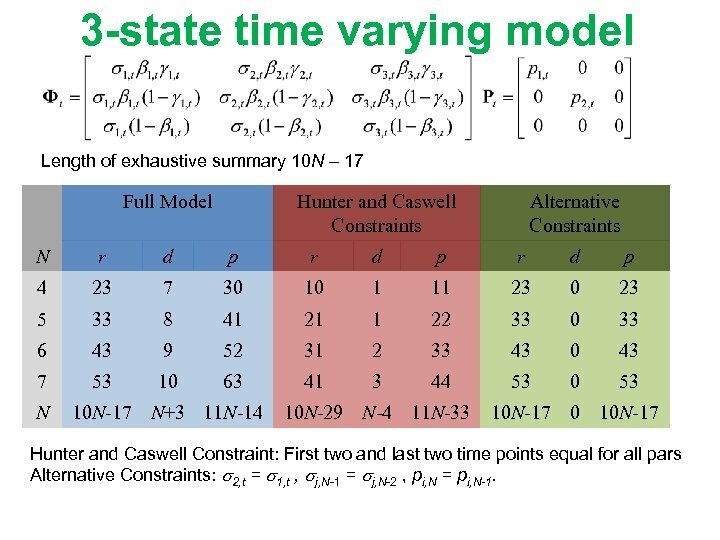 3 -state time varying model Length of exhaustive summary 10 N – 17 Full Model Hunter and Caswell Constraints Alternative Constraints N r d p 4 23 7 30 10 1 11 23 0 23 5 33 8 41 21 1 22 33 0 33 6 43 9 52 31 2 33 43 0 43 7 53 10 63 41 3 44 53 0 53 N 10 N-17 N+3 11 N-14 10 N-29 N-4 11 N-33 10 N-17 0 10 N-17 Hunter and Caswell Constraint: First two and last two time points equal for all pars Alternative Constraints: 2, t = 1, t , j, N-1 = j, N-2 , pi, N = pi, N-1. 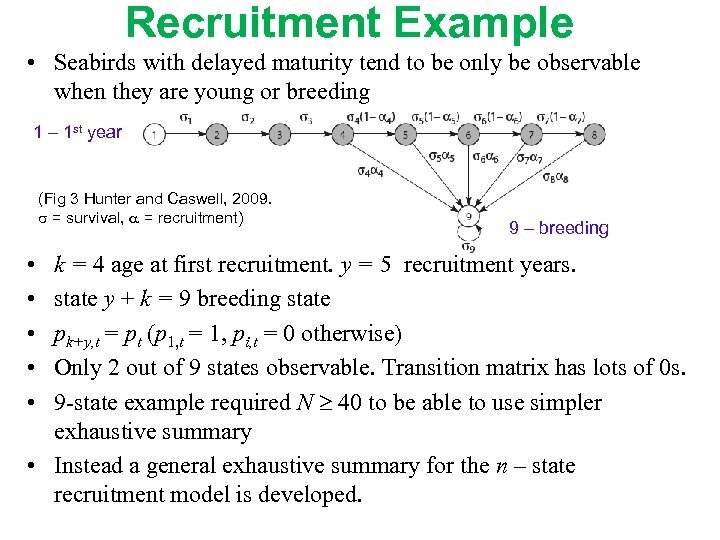 Recruitment Example • Seabirds with delayed maturity tend to be only be observable when they are young or breeding 1 – 1 st year (Fig 3 Hunter and Caswell, 2009. = survival, = recruitment) • • • 9 – breeding k = 4 age at first recruitment. y = 5 recruitment years. state y + k = 9 breeding state pk+y, t = pt (p 1, t = 1, pi, t = 0 otherwise) Only 2 out of 9 states observable. 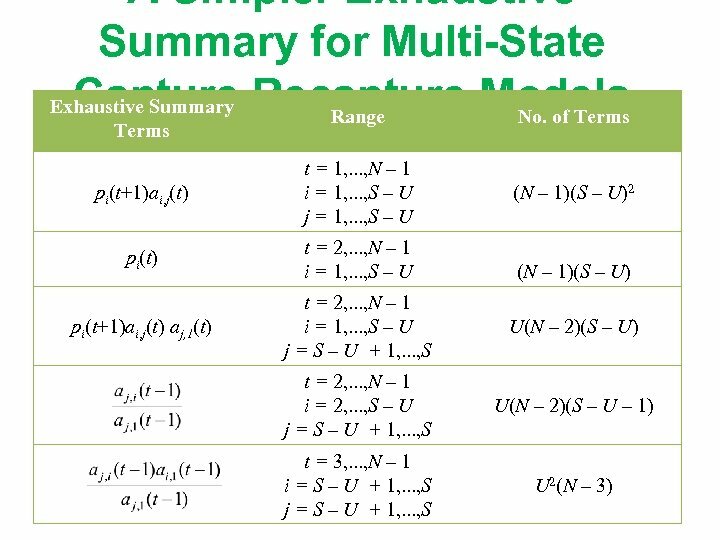 Transition matrix has lots of 0 s. 9 -state example required N 40 to be able to use simpler exhaustive summary • Instead a general exhaustive summary for the n – state recruitment model is developed. 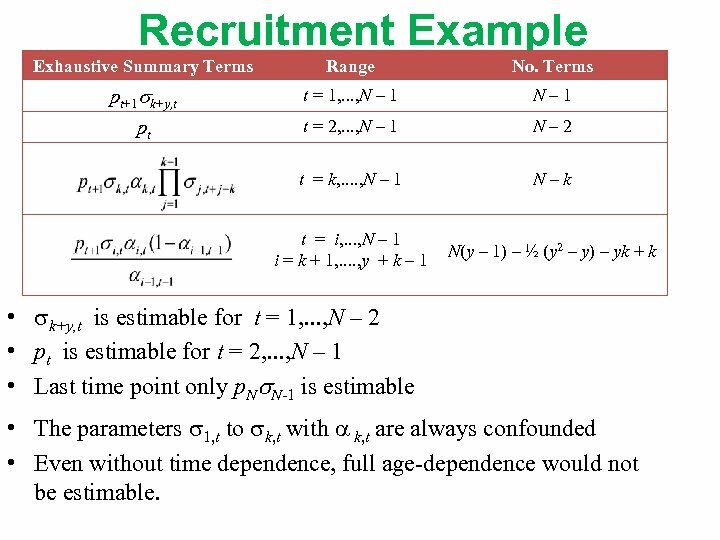 Recruitment Example Exhaustive Summary Terms Range No. Terms pt+1 k+y, t t = 1, . . . , N – 1 N– 1 pt t = 2, . . . , N – 1 N– 2 t = k, . . , N – 1 N–k t = i, . . . , N – 1 i = k + 1, . . , y + k – 1 N(y – 1) – ½ (y 2 – y) – yk + k • k+y, t is estimable for t = 1, . . . , N – 2 • pt is estimable for t = 2, . . . , N – 1 • Last time point only p. N N-1 is estimable • The parameters 1, t to k, t with k, t are always confounded • Even without time dependence, full age-dependence would not be estimable. Discussion • Based on these advantages and disadvantages: – if interest lies in whether a particular model for a specific data set is parameter redundant then a numerical method would be sufficient. 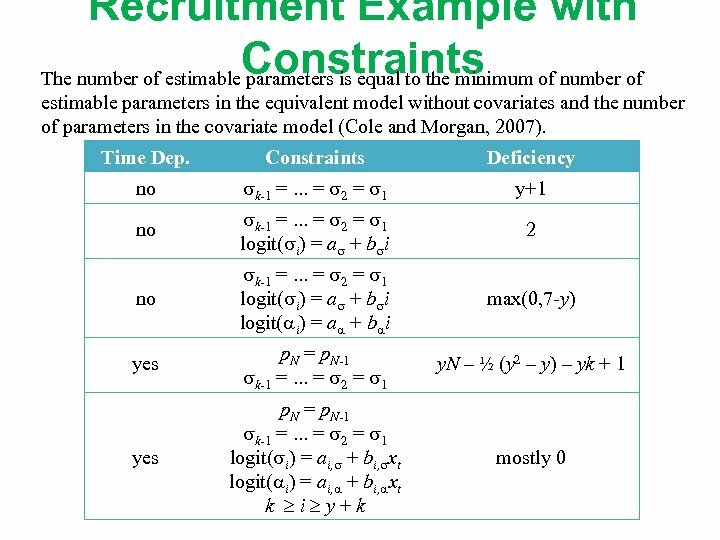 – However if interest lies in the redundancy of a model in general or a particular class of models, general rules can be found using the symbolic method. 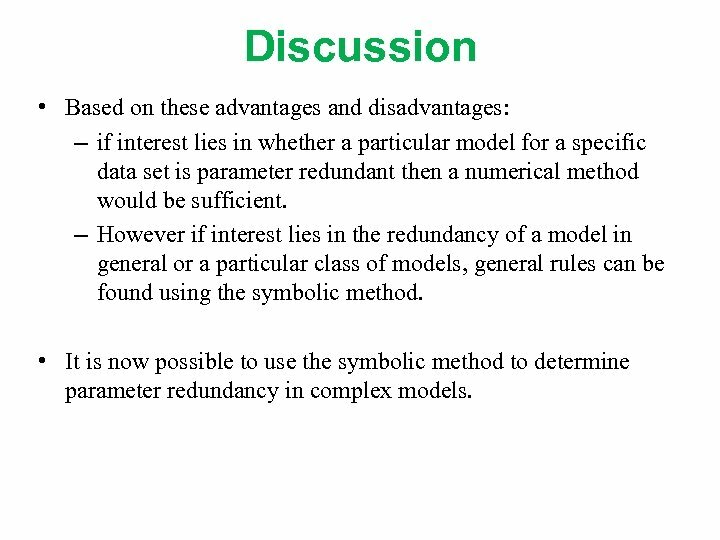 • It is now possible to use the symbolic method to determine parameter redundancy in complex models. 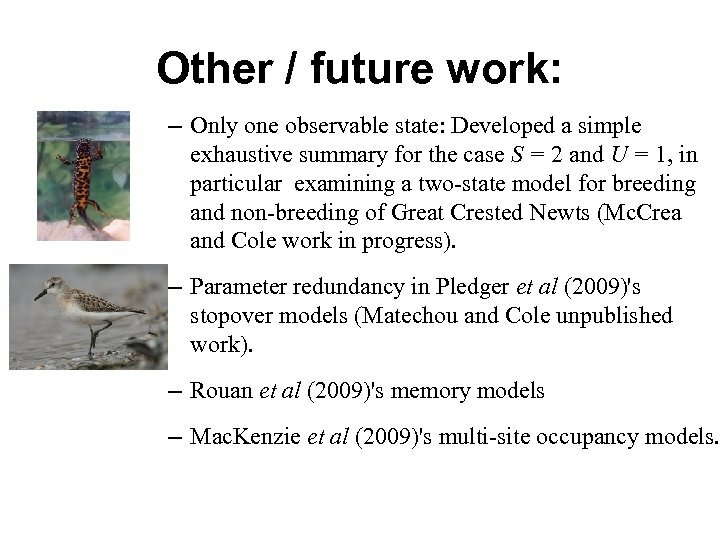 Other / future work: – Only one observable state: Developed a simple exhaustive summary for the case S = 2 and U = 1, in particular examining a two-state model for breeding and non-breeding of Great Crested Newts (Mc. Crea and Cole work in progress). 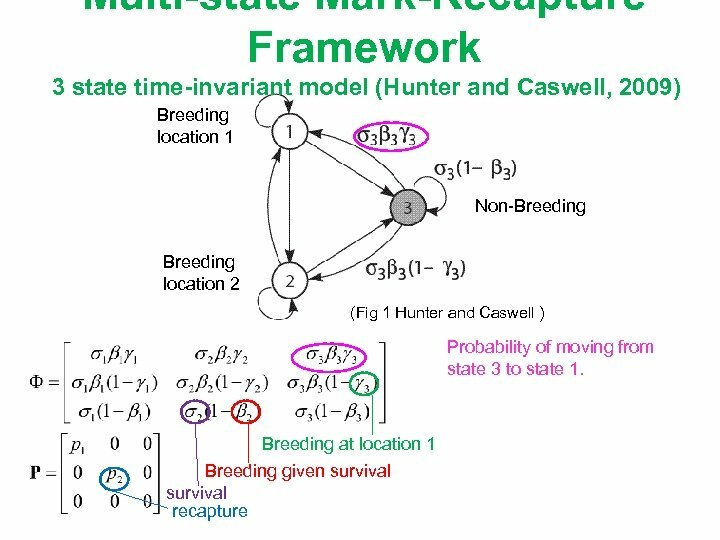 – Parameter redundancy in Pledger et al (2009)'s stopover models (Matechou and Cole unpublished work). – Rouan et al (2009)'s memory models – Mac. 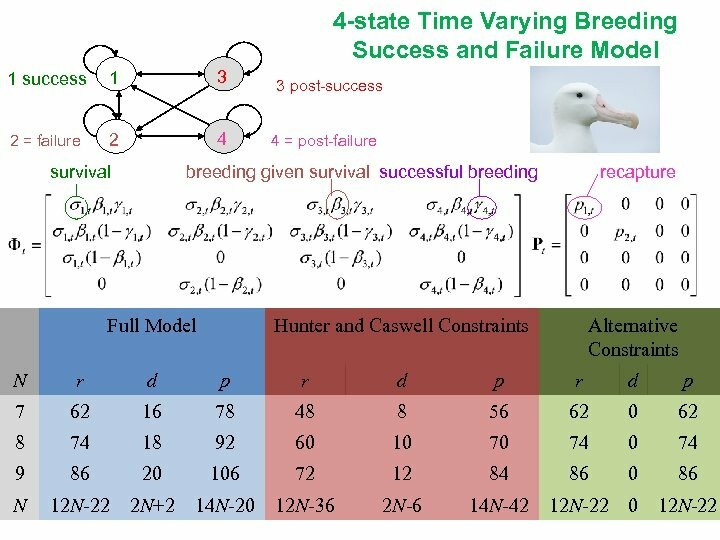 Kenzie et al (2009)'s multi-site occupancy models.